In response to a question asked by a student at a meeting with locals in Kalay Township in Sagaing Region on January 22, Myanmar State Counselor Aung San Suu Kyi said an administration shouldn't terminate foreign-invested projects approved by its predecessor. If the government breaks a promise made by its predecessor, the country will lose its credibility and "no businessperson would want to invest in this country,"she said. Suu Kyi's remarks coincided with a new round of attacks launched by some Myanmar people on the China-invested Myitsone Dam. Her remarks at this time are meant to send a political message. China signed agreements with the then Myanmar government on a slew of projects when Myanmar was under Western sanctions, including the Myitsone Dam, which was suspended in 2011. Recently, some local people have openly called to scrap the project. Western sanctions had wrecked the Myanmar economy and people's livelihood was affected. China offered a helping hand at Myanmar's most critical time. The Yeywa Hydropower project, built with the help of Chinese firms in 2011, has improved electricity supply in Yangon. If completed, the Myitsone project, will help improve power supply in the Southeast Asian nation. 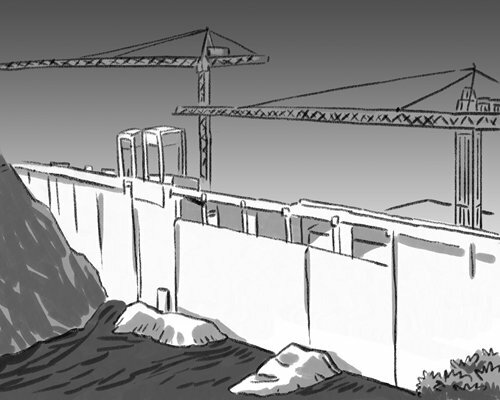 The reasons behind the dam's suspension are very complicated. But since the deal was signed, Myanmar will be in breach of the contract if it decides to scrap the project. In that case, Nay Pyi Taw will be required to pay compensation. Rumors are swirling that China is pressuring the Myanmar government to resume the project. A $3.6-billion project has been stalled for eight years, shouldn't China inquire? The Myitsone dam could have helped create jobs in surrounding areas. With the project suspended, locals lost jobs and the local economy was bruised. Although the interests of the Chinese investor and its joint venture were undermined, they didn't stop providing assistance to residents. In order to completely terminate the project, some Myanmar people slandered China, claiming Beijing aims to plunder Myanmar's resources and the dam will damage the environment. As a matter of fact, there are two different opinions about the environmental impact of the Myitsone dam. The one in favor of the dam has been deliberately neglected, which has prevented unbiased opinion from coming out. China has always respected the will of Myanmar, including the wishes of people of Kachin state. However, dealing with a project under contract should be in keeping with international practices. If there are new public demands or environmental concerns, talks should be held and stoking nationalism isn't a solution. People in Kachin state should understand that Myanmar is a sovereign country and the border issue with China has already been resolved. Despite clashes between the Kachin ethnic armed group and the Myanmar military, it's beyond doubt that Kachin is a part of Myanmar. Foreign-invested projects in Kachin should take the interests of the state into consideration. But according to international practices, foreign companies cannot sign with local government another deal different from one signed with central government. It's a matter of Myanmar's sovereignty. The country is taking measures to attract foreign investment, including promulgating a new investment law and company law. The Myanmar Investment Commission launched its Myanmar Investment Promotion Plan in October last year. It is aimed at attracting $200 billion in foreign investment over the next 20 years and leading Myanmar into becoming a middle-income country. The Myitsone project can help address the power shortage Myanmar is grappling with, laying the foundation for foreign investment in other fields. How it deals with the stalled project in accordance with international practices will determine Myanmar's investment environment, the government's credibility and the long-term development of northern Myanmar.